For some apps, namely the ones that need a credit card for payment, I’ve often held off on signing up until I had time to deal with registration, passwords, credit card entry etc. In recent years, many apps have tried to make this easier with the ability to take a photo of your credit card instead of typing it in. This never worked for me as the numbers on my card are often too faded. Yesterday I decided to give Lyft a try. I installed the app and signed up. I love how many/most apps are using SMS to deliver a code vs the old school “check your inbox for a link to confirm you aren’t a robot”. Lyft sends the mobile code as well so step 1 was a breeze. Next, payment. I removed my credit card from my wallet and put in on the table. 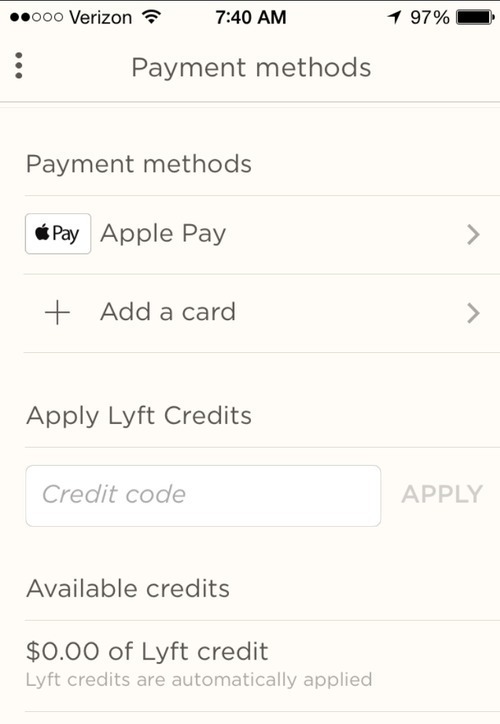 I went to the Lyft payment screen and was ready to type in a bunch of digits. Instead, this is what I saw. My Apple Pay credentials were already enabled and turned on by default. Mobile onboarding has changed forever.